The slates wiped clean and the way is fresh with hope. It’s a New Year and anything is possible, including you; finally owning your own home if that has been your earnest desire! Take a close look at the quote above and imagine; one of those rabbits is your dearest dream, but that other rabbit? It could represent any of a variety of things that distract you from your desired goal of owning your first home, selling your current home to move up and on to better things or finally purchasing the vacation hide-away you’ve been promising yourself forever. Starting right here and now resolve to give chase and catch what you truly crave. You’ll be well on your way to realizing your real estate goals this year. This real estate climate is like the perfect storm for those looking to buy or sell a home. The ¼% interest rate hike is the first one in almost 9 years, but will have little to no effect on mortgage interest rates. Thankfully those rates remain under 5% so your cash still enjoys greater buying power. Home prices have climbed the hill and gone over the top, restoring equity and gaining in the recovery process. If you’ve been watching the market you already are aware of how closely inventory levels resemble that almost too tight to wear favorite pair of jeans. Not quite tight enough to be discouraging and there’s hope things will loosen up soon enough. Forecasts moving into 2016 are all pretty encouraging. New construction has taken a decidedly positive stride forward. The American Institute of Architects has drafted some very positive blueprints looking ahead. Their recent survey reveals people are leaning heavily toward eco-friendly homes, with an emphasis on organic building materials over synthetic ones. You might think the Smart Home trend would dominate the list of features most desired, but the survey did not support that theory. Most surprising is that young people are most likely to forego these upgrades, mainly because of the cost involved. Better storm proofing methods was high up on the want list as were homes built with an eye to accommodate its occupants as they age being another big on the list. Even so, energy efficiency remains the most desirable feature in new homes and home renovations. In addition to the efficiency considerations for HVAC fixtures and appliances, there has been renewed interest in beneficial alternative energy sources specifically for w hen u tility outages occur. Things like wood burning capabilities and built in backup generators top this list. As we look ahead at what the experts tell us we can expect from our real estate markets moving into 2016, we must note that 2015 finished with healthy numbers, reflecting m ainly t he usual holiday and winter slowdowns. 323 homes around the Boulder area sold in December and the annual sales total of 4910 gives a clear sense of a steadily growing, healthy real estate market. The 57 average days on market we’ve experienced in December matches last year exactly. An average median sales price of $420,000 which includes single family and condo units is a nice jump from the 2014 average median sales price of both in December of $364,000. 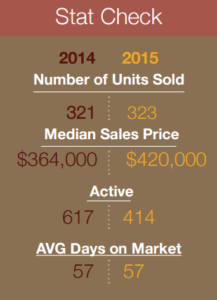 Active listings for the month were at 414, significantly below the 617 this same time period in 2014. Consulting with your local REMAX Alliance agent can ensure that the rabbit you pull out of the hat this year is the perfect one for achieving all your greatest real estate objectives in 2016.